Rain is a daughter of our gorgeous Clover (Sup Ch Ridgesetter Etain) and Tommy (Ch Byerley Hilfiger. It's widely acknowledged that Rain has superb side gait and holds her shape well on the move. A Res Challenge winner at the 2013 National from the Junior Class, Rain has 15 Best In Groups and multiple Class in Group awards. She has the same soft nature as her mum and 130 points shy of her Supreme Championship, we had puppies in February 2016. She had a big litter of 11 pups from which we have kept Lola (Ch Ridgesetter Looks Like Rain) and Zoe (Ridgesetter A Little Rain). 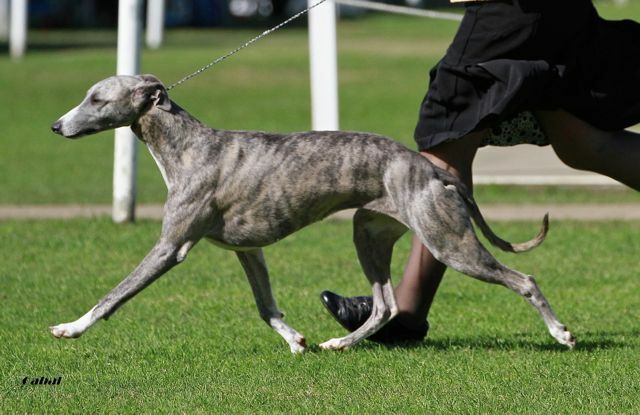 The litter brother, Riva (Ridgesetter Rhythm Ofthe Rain) is with Kaz Cleave of Bundoon Whippets. The litter certainly took it's toll on Rain and her shape 'blossomed' from the pregnancy. Rain's second litter was born in August 2017 from our Bentley from which we kept Shelby. Rain is retired from the showring and spends her days as a house dog with her mum, Clover.